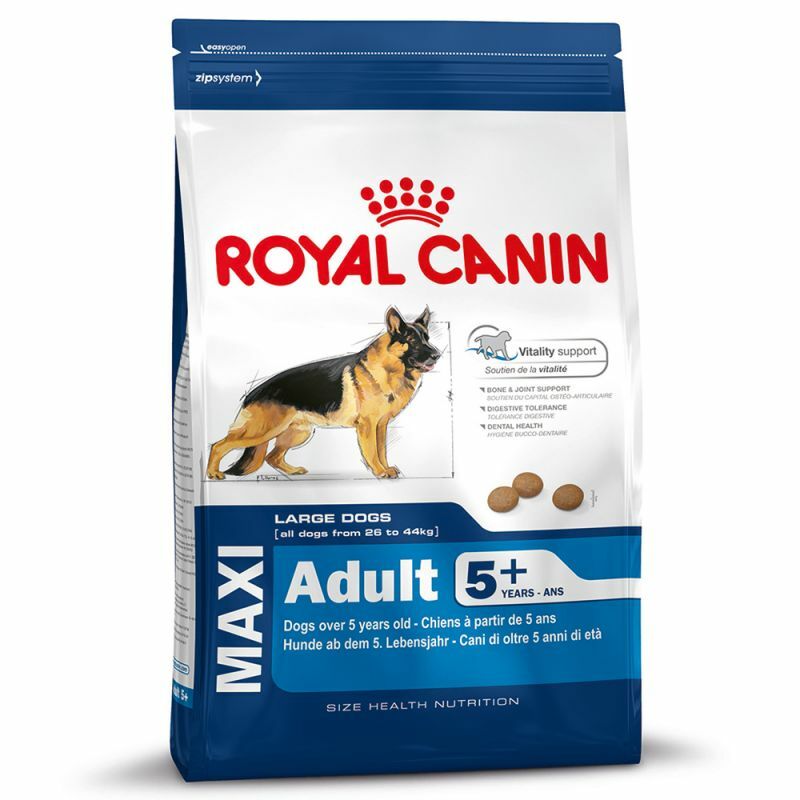 Royal Canin Maxi Adult 5+ helps maintain vitality in senior dogs over 5 years. Helps promote health and mobility in older dogs. 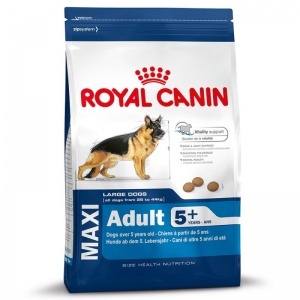 Royal Canin Maxi Adult 5+ for large breed senior dogs contains a synergistic complex of antioxidants to help support natural defences while reduced phosphorus helps maintain kidney function. A highly digestible formula with rice fructo-oligo-saccharides EPA and DHA. Royal Canin Maxi 5+ helps maintain healthy joints in senior large dogs with high levels of glucosamine and chondroitin. Helps reduce the development of tartar with sodium polyphosphates. dehydrated poultry protein; rice; animal fats; wheat; maize flour; wheat flour; vegetable protein isolate*; hydrolysed animal proteins; maize; gluten maize; vegetable fibres; minerals; beet pulp; fish oil; yeasts; soya oil; psyllium husks and seeds; fructo-oligo-saccharides; borage oil; marigold extract (source of lutein); green tea and grape extracts (source of polyphenols); hydrolysed crustaceans (source of glucosamine;) hydrolysed cartilage (source of chondroitin). Technological additives: Pentasodium triphosphate: 3.5 g - Preservatives - Antioxidants.